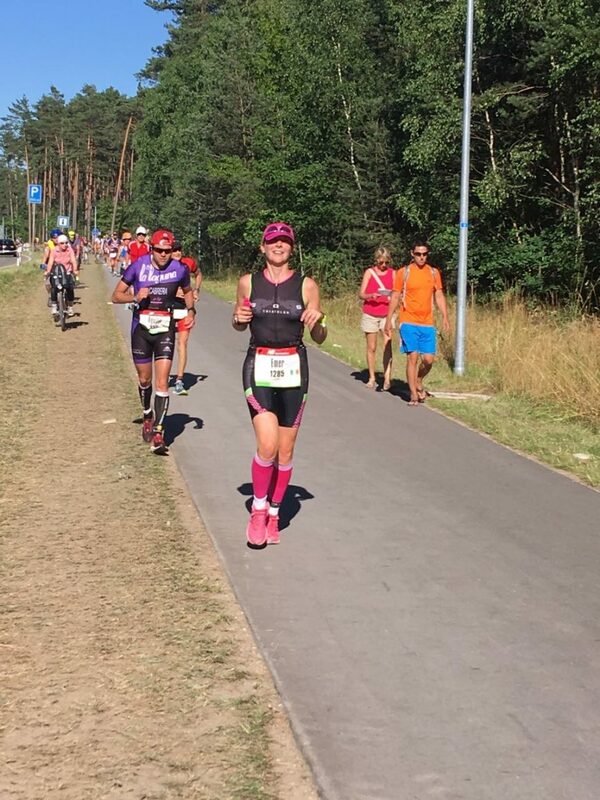 Emer Sandham’s experience of her first Challenge Roth Full Distance Race. In July 2013 I watched my first open water triathlon in Chester, the next year I did the race. Over the following years I have raced many sprints, and standard distance events with varying success. Suffice to say I have well and truly caught the triathlon bug. 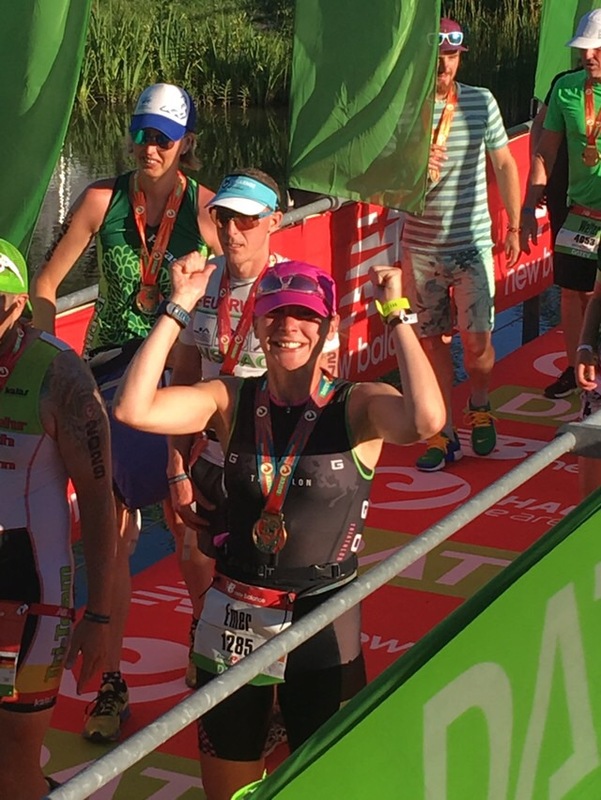 As you’ve seen on the Tri-Rox blog before I have been coached by Rhian since January 2017, so when she asked me to do a little review of my ‘road to Roth’ I didn’t think secondly. The reason was three-fold, firstly I loved it so much I want to share my story, the second reason is to show anyone who aspires to ‘go long’ that it is totally possible and the third, of course, is to show my gratitude to Rhian for the great job she did preparing me for the race. I have to start by saying the decision to do Roth was made a full year before the race, I committed to going long as soon as the 2017 season finished. Those of you who know me will know that Autumn last year was a difficult time for my family, for this reason I was restricted to unstructured training, comprising running and the odd swim session for the month of October, but as soon as I returned to Wales in November the serious training started. Committing to a race so early in the year was strange, in one way it was great motivation to keep getting out training over winter but on the other it sometimes felt hard to focus on something so far away. There were nights where I struggled to leave the fireside in the dark or rain to attend Monday run and swim session, and there were a few cold and wet Sunday rides that I wished I didn’t have to do, however I knew that every time I headed out the door training I was one step closer to Roth. Of course, having a training plan is a constant reminder of what needed to be done and my plan was delivered weekly. It was a gradual build over winter in all three disciplines with some racing thrown in before the big day in July. As I had a hamstring injury last year the running increased very gradually. I had intended to race a half marathon in March but hadn’t done enough run mileage by then so decided to forego my place. At the time this really worried me as I really wanted to try a half having never raced more than a 10km, but in hindsight it didn’t make a huge difference. I competed in a couple of small races early on to wake myself up after winter, however I was bitterly disappointed when I got struck down with a chest infection before the Slateman Triathlon and could not take part. I’ve never really suffered with things like that before but had two bouts this year which really wiped me out. Clearly, this level of training takes it toll on the immune system and despite my relatively healthy diet and lifestyle I became acutely aware of the need to keep my body as strong as possible, do everything I could to recover sufficiently after sessions and, just as importantly, get enough sleep. In June I took part in the Chester Deva Middle. I went into the race knowing the course after our ‘Roth crew’ (7 friends at the club who had all managed to get an entry into Challenge Roth 2018) did a couple of recces of the bike route, and I had swum in the Dee and run around the Meadows in the Diva Devas in previous years. I wanted to use this race to practice fuelling and pacing under pressure. I was thrilled to be joined my elder sister on race day, who was taking on her first half too. Having her there gave me an extra incentive to push harder as she had been chasing Robin and I around on our bikes in Mallorca a month or so earlier. The race went well, I was pleased with my performance and it gave me a confidence-boost ahead of Roth, now at least I knew I was able to do half the distance. The weeks after Chester were probably the hardest but most rewarding. I challenged myself by doing some long miles on my own to prepare mentally as well as physically for race day. I juggled real life, work, friends and family reunions as best I could to make sure I fitted those critical last training hours in. The hard graft culminated with a 6-hour solo ride on the worst June day there was, followed by my longest run in baking heat, another solo 32km trot taking in the Great Orme for good measure. That weekend I knew there wasn’t really much more I could do to prepare. Having said that the thought of running a marathon was still scaring the daylights out of me. Going long means a three-week taper which I was ready and grateful for. Of course, I had some phantom niggles and last-minute panics but I was told that’s totally normal, so I tried to ignore such thoughts. We left for Roth on the Tuesday before the race. It’s a 500-mile drive from Conwy and took 2 days with an overnight stop. Arriving in Roth on Wednesday night I had my first flutter of butterflies, the ‘Welcome Triathletes’ signs were up alongside lots of other event paraphernalia. There was a buzz about the place that we would see grow over the next few days. The Roth crew met up on Thursday morning for a leg loosener and to check out the swim course. Having Carlo and Greig who raced here in 2016 with us was so useful, they gave us great advice and showed us where to go for registration and all-important refreshments, although as ever it was Robin (my husband) who ended up working out directions on the bike recce. The canal looked good, the roads were smooth and the weather was warm, what more could we ask for. 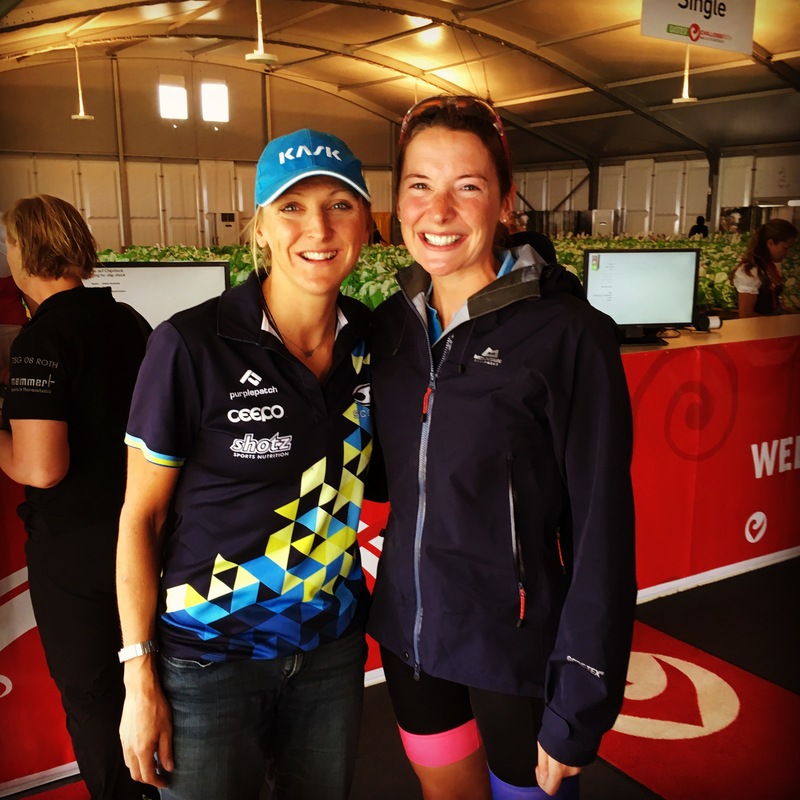 Having registered and explored the Triathlon Expo, we did some Pro spotting, with Laurie winning the prize for making firm friends with Belinda Granger who was there to support the event, and I had a good old chinwag with Laura Siddall. I maintain that one of the best things about triathlon is how the Pro’s mingle with the norms like us, we were all registering together, racking together and racing together, and they are just as enthusiastic about the event as we were. On the Saturday before the race my aim was to do as little as possible. I had booked an apart-hotel so we could have some space pre-race, there was a small pool and roof garden and most importantly a kitchenette which enabled us to cook and eat as ‘normally’ as we would at home in the run up to the race. That morning I packed and unpacked my transition bags a couple of times. These bags were a whole new concept to me and owing to my maximum comfort strategy of three kit changes, they had to be prepared properly ensuring the right kit was in each bag; plus the right fuel, sun cream, hat etc. The transition bags had to be handed in with the bike on Saturday so there was no margin for error. I sat round and tried to distract myself for the rest of the day, reading and listening to music. Robin managed to escape the tension for a quick run, then prepared my usual pre-race dinner. Eventually the time came to take the bikes out to Roth, queuing up to rack the bikes and taking my first few steps into transition brought on another bout of butterflies, I couldn’t believe we were finally here. After racking we made our way back into the town for the race briefing, ensuring we attended the English session (several languages were available which shows what an international race it is). The briefing lasted over an hour and was well delivered, with a warm welcome, a section on the course, the rules and nutrition options. As soon as it was over we headed home, we all wanted an early night. With the help of my earplugs and eye-mask I did sleep but not particularly well, come 4am I was well and truly ready to rise and shine. The ‘Roth Crew’ decided to make our way out to Roth separately rather than in a convoy but funnily enough on turning off the motorway we were reunited in the line of traffic. Having Pro spotted Lucy Charles and parked up in one of the big fields at the swim start, together again the Roth crew and supporters made their way across the bridge to T1. Seeing transition at dawn at we walked across the bridge was pretty special, and stopping to let a guy take an unobstructed photo was pretty inspiring too, as I would see him later on in the day racing on blades and be absolutely blown away by his determination and true grit taking on an IM distance race with one arm and no legs. We had time to check our bikes, gear and see the Pro’s start before the cannon was due to be fired for our wave. 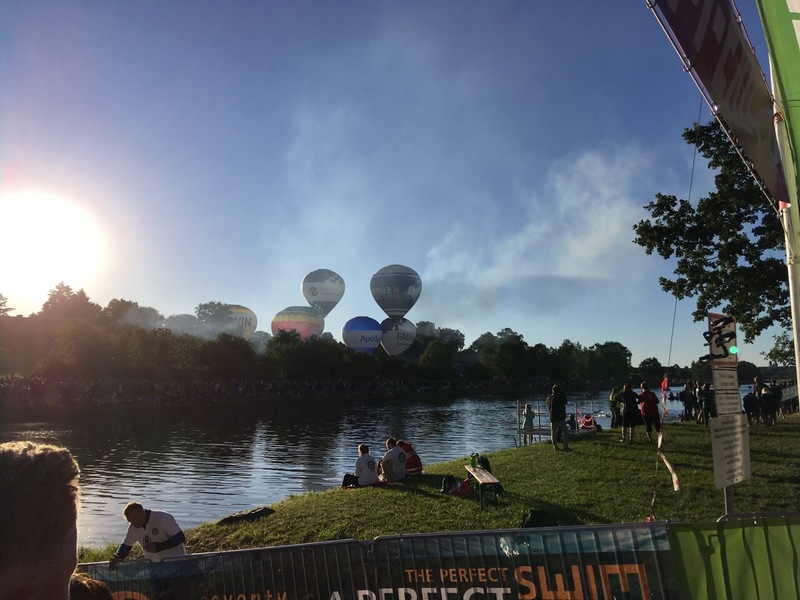 There was music, hot air balloons, thousands of people spectating and a nervous buzz around transition. We didn’t have the best view of the Main Donau Canal from our holding pen but we could see that the start was a little frenzied, I just hoped the women in our wave would be a bit less overexcited than the men we were watching. The time came when the two ladies’ waves were called, ours was 7.10am. To the sound of Coldplay Laurie and I lined up, wished each other well and descended the ramp into the canal. I got in and swam a little, I couldn’t resist turning around and treading the water for a few minutes just to take in everything that was going on. Everyone had advised me to enjoy the day and the experience, this stop was to take in the moment, about now I had another surge of butterflies at the awesomeness of the whole setup. At 7.10 our cannon blasted and we were off. Erring on the side of caution I started close to the back of the group and tried to stay in the middle of the Canal for ease of sighting. Every five minutes you could feel the reverb of the starting cannon for subsequent waves. The group spread out fairly quickly and I found some space. I tried to find some feet to follow but failed miserably, they were either too slow or too fast, so as per usual I was swimming solo. The stronger swimmers from the subsequent waves passed like fish as I steadily plodded on. The swim route is relatively straightforward, a single loop 1.5km up the canal, 1.9km down the canal and the 400m from the last turn back to the start. I broke it down, a half IM swim, an Olympic swim and a sprint. The sprint seemed to take the longest time, probably owing to the anticipation of exiting the water. My swim was relatively evenly paced, as my plan was for a steady swim, after all there was no point going out too fast in this race. I felt good exiting the water, I kicked hard for the last few minutes to avoid a fuzzy head and it worked. Checking my watch on the ramp I was happy with my 1.17.01 swim time. Transition 1 was uber efficient from the point of view of my ‘helfer’ (helper) anyway. She was fantastic. There was an army of volunteers, i.e. the helfers, ready to assist athletes in transition. They grab your bag, find a space for you in the transition tent, spill the contents of your bag onto a bench and help you sort yourself out. My helfer did all of this, quicker than I could put on my socks. I changed from my tri-suit into my biking gear for comfort, I was conscious of the time this would take but I thought it was better to be comfortable as I was going to be out on the bike for a while. I left the changing tent, located my bike and headed out to the mount line, with a shout from Robin on the way. I was pleased to be moving on to the bike, my favoured part of the race. The initial surge from T1 soon calmed down and we headed off around the scenic Bavarian countryside. My strategy for the bike was to keep a close eye on my HR and hope I could maintain a decent average speed. I planned to take on water, electrolytes and my own race food at set intervals so I was watching the clock a lot. This worked in training and it helped pass the time and keep concentration on the 180km ride. I had had some issues with my hip owing to my position on the bike in the run up to the race so ended up riding most of the course on the hoods. This was more comfortable for me but was quite disheartening initially as the TT bikes and aero riders whizzed by. Really it is a course made for a TT bike, owing to the profile and good surfaces. However, there were lots of road bikes with clip on TT bars too. The bike course took us though woodland, farmland and lots of little villages where the residents had set up BBQ’s, tables and chairs and even some DJ’s. There were water/feed stations every 17.5 km, mostly along inclines where we naturally had to ride more slowly. These were super organised and manned mostly by a mix of adults and eager youths. Although there was over 1500m of elevation on the course, by North Wales standards the climbs were fairly insignificant, no Llanrwst Hill or Nebo to contend with. The slightly rolling nature of the course allowed for good recovery between the inclines too. Coming close to the end of Lap 1 the pro men passed, the motor bikes came through first, then the bikes. They were really moving, how they travel at such speed is beyond me. I was in awe. Soon after I recognised the village we were passing through and I knew we were approaching Solar Hill. As I turned the corner and beheld the sight and sound of hundreds of people lining the road the hairs on the back of my neck stood up. It was astonishing, the closest thing you will feel to being a professional cyclist being willed up the hill by super excited supporters five deep on the road. I pedalled steadily up that hill with an ear-to-ear smile, again trying to enjoy the moment. When I reached the top of Solar Hill I glanced at my HR, it had shot up, I thought I will have to take it easier going up here on Lap 2, if there would be anyone left out there. Incidentally they hung round, they were there for the day, such great support. I spent much of the second lap being overtaken by the relay riders. I didn’t actually realise they were the relay riders until Carlo caught up with me and told me the dark numbers were the relay bikers. We had a quick chat and we cursed them together. They were flying, but they could, they didn’t have a marathon to run next. Carlo cruised off and I kept rolling. The bike was generally OK, but I had a couple of moments where I felt like my concentration was lapsing and the kilometres slowed down. Each time I re-focussed trying to remember to watch the clock, speed and remember I was supposed to be enjoying the day. Coming into T2 I glanced at my Garmin before I passed my bike to a helfer, the Garmin said 6.30hours, again I was happy with that. T2 was the same as T1, with helfer to hand I de-robed and put on my GOG trisuit. I knew this would be comfortable to run in, and wouldn’t rub if it was wet. I changed, gave my salty face a quick rinse, put on more sun cream, and had a pee. This rather leisurely 10-minute transition was possibly my worst of all time (even longer than my first triathlon back in 2014!) but comfort is key when your about to embark on your first marathon. The first few km’s of the marathon were through woodland where there were lots of supporters and lots of other athletes passing on their return lap. I was keeping an eye out for Greig and Rocky but must have just missed them. The woodland offered some shade and the surface was a nice trail rather than tarmac. The trail continued through a small industrial area onto the bank of the canal. There were lots of supporters on the first section of the canal and before we knew it we had run 10km. My run strategy was to find a steady pace of 5.5 to 6 min/km, keep an eye on HR and fuel at set intervals. I was taking on gels for the run as I wasn’t keen on solids whilst running. I hadn’t trained with the gels provided on the course so I opted to carry my own. I had some in my belt and had arranged to see Robin at the last feed station on the Canal where he was allowed to pass me my gel flask filled with my favourite peanut butter flavoured gel to keep me going until the end. Although the Canal wasn’t the most inspiring section of the route, there was a constant stream of people running both ways and I saw Sion, David and Carlo a couple of times which gave me a lift as we shouted encouragement at each other. The feed stations were spread along the Canal and a welcome addition to these were bins full of sponges to cool us down as the temperature was creeping up through the day. Leaving the Canal I knew I had a half marathon done and I felt pretty comfortable. On the return to the forest I was looking forward to passing through town. The lads had told us there would be a great atmosphere in central Roth and they weren’t wrong, it was buzzing. After the town centre, we passed a residential area where people where holding hoses and kids were running about with more sponges. The kilometres seemed to be floating along with ease as there were so many distractions. However, the sting in the tail of the run was on the route out to Buchenbach where there was a tough climb, which was reducing a lot of people to a walk. I had a short walk early on as I took on some water at the aid station, then kept plodding up trying to remember what goes up must come down. The road levelled out in Buchenbach, where the village centre was full of spectators who seemed to be getting more jovial as the hours passed. The turnaround point was a little pond lined with school children’s drawings of the national flags of each of the 70 countries from where people were participating. I spotted the ‘tricolour’ with a few shamrocks drawn alongside the flag and felt very fortunate to be here. I wondered how my 21 other countrymen and women were getting on. I was able to cruise a bit on the return downhill letting my hips open up and legs stretch out a bit. The next few km back to Roth passed quickly and before I knew it I was heading back through the town with enough in my legs to kick a little onto the home straight. Entering the little stadium was wonderful, with the crowd, the noise and lights, I really felt such an overwhelming sense of achievement. I crossed the line in the midst of a couple of relay teams, removed my chip and received my finishers medal from a lovely young German girl. I stood for a few minutes at the back of the finish line to take it all in, then had a look around for Robin. I found him and rushed to the bridge area for a celebratory hug, and obligatory ‘thumbs up’ pic to send on the family who he had been keeping posted on my progress all day. We made it, it was an emotional reunion. I’m sure spectating at an IM distance race is as hard as taking part, he popped up in so many places through the day by bike and on foot, Robin deserved a medal too! The fantastic set up extended to the recovery area, there were hot showers with toiletries, food, 100 massage tables and seating areas for weary athletes to swap stories, sip an Erdinger Alkofrei and chill out together post-race. I quickly drank my post-race protein shake, showered, grabbed a freshly made sandwich stuffed with local cheese and ham and made my way out to Robin, collecting my finishers certificate, t-shirt and beer glass en-route. Picking up the certificate I looked at my race splits for the for the first time and realised my 12.11.22 finish time was well within my race target and I had run the marathon in 4.05. For a first timer this was a respectable cumulative result and not a bad marathon time either. We had a fleeting sit down and de-brief, trudged over to collect my bike at T2, met up some of our Roth crew, then returned for the final finisher crossing the line at 11pm. The Pro’s and the race Organisers gave short speeches and Felix spoke passionately about how the race has transformed the little-known Bavarian town to a mecca for triathletes over 35 years. The night closed with a stadium full of sparklers and a huge firework display which lit the sky as we left the stadium. It really was an awesome day. Going long was a fantastic experience, whilst I didn’t break any records, I thoroughly enjoyed the race. On reflection I also liked the preparation and training, the planning and the organisation of it all too. I’m a Planner by profession, perhaps that’s why. I had a great training plan from Rhian and I knew I had done the work. I had tried to prepare mentally for the day as I was acutely aware that preparing my mind was as important as training my body. Some people say ‘have a mantra’ or use visualisations to get you through a race, there are lots of other distraction tactics too. I tried to keep a smile on my face and think positively through the day, we all know it’s easier to smile than frown. My younger sister and a friend who had both raced this distance gave me so much advice and encouragement before the race and were such an inspiration to me, I thought of them a lot on the day too. Funnily enough both were recovering from a horrendous year and knowing they were making such progress to mend their bodies and endeavouring to start their triathlon training again gave me such mental strength and motivation to keep moving. If they got through their respective woes this year and want to train and race again, the least I can do when fully fit is swim, bike and run for a day. It goes without saying that breaking the day down, and strictly following my race plan also worked well for me. If you’re tempted to continue your own quests in triathlon and go longer I’d say have a chat with Rhian and just do it! If you love the sport, have the time, inclination and like to follow a long-term plan then IM distance could be for you. I never dreamt that I’d be willing or able to run a marathon, let alone do a long-distance race, but five years on here I am, an ‘Ironwoman’ looking for her next race! That was superb Emer. Inspired and enthused, this has got me thinking more about doing an IM in the not to distant future. Great Bleddyn, I recommend both Roth and Ironman Wales if you are going for unique races with an amazing atmosphere!